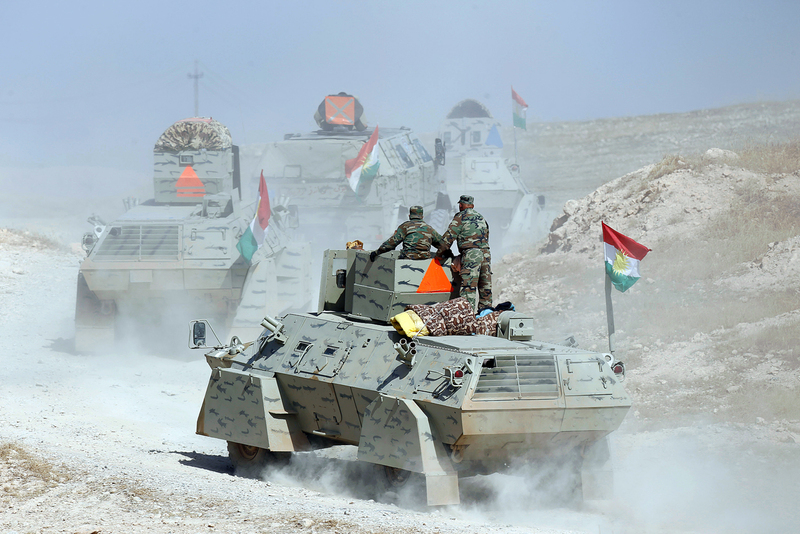 Peshmerga forces advance in the east of Mosul to attack Islamic State militants in Mosul, Iraq. Mosul, the largest ISIS-controlled city in Iraq, has been stormed by the U.S.-led coalition but, despite the massive numerical superiority of the coalition forces, Russian observers predict that the battle for Mosul will be long and bloody. A major cause is disagreements among the enemies of ISIS. The operation to liberate Mosul, the Iraqi which has been under the control of ISIS militants since June 2014, is underway. According to different estimates, there are between 700,000 and 1.5 million civilians, and from 5,000 to 10,000 militants in the city. The offensive, announced by Iraqi Prime Minister Haider al-Abadi on October 17, involves 60,000 people; Iraqi army forces, Sunni and Shiite militias, as well as Kurdish Peshmerga forces. Air support is being provided by the U.S.-led international anti-terrorist coalition's air force. "The moment of great victory is near," said al-Abadi, announcing the assault on Mosul. But a week after the operation began, it is clear that serious difficulties have arisen. Soon after the operation began, a conflict broke out between al-Abadi and Turkish president Recep Tayyip Erdogan about Turkish troops participating in the storming of Mosul. With ISIS now launching counterattacks in the already liberated cities, U.S. presidential candidate Donald Trump has called the offensive of the U.S. and its allies on Mosul "a total disaster." Who is going to do the fighting? Military expert Vladimir Yevseyev, deputy director of the Moscow-based CIS Institute, believes that the coalition's numerical superiority is not critical. What remains, according to Yevseyev, is only the regular Iraqi army, where there are many deserters and flourishing corruption. "A maximum of 30,000 of the announced 60,000, maybe even less, will advance," Yevseyev told RIR. "In urban settings, with good engineering preparation [carried out by ISIS], such forces will not be able to take the city." He also explained that Mosul is not blocked from the west, allowing the terrorist forces to receive reinforcements: "It is definitely not possible to ensure victory by the November 8 presidential election as [the U.S.] planned," he said. Leonid Isayev, an Arabic scholar and senior lecturer of the political science department at the Higher School of Economics in Moscow, also believes that a prolonged war lies ahead. "For the province, for the settlements near Mosul, and then for each neighbourhood of the city," Isayev said. The battle for Mosul, he said, promises to drag on for months and lead to a large number of casualties. Even a victory over ISIS in Mosul will not bring peace to Iraq, say Russian observers. A new conflict, ethnic or confessional, is likely to break out there. Isayev recalled that, over the past two years, the Shiite militias that liberated Sunni villages from ISIS often simply massacred their populations for "collaborating with the enemy." The Kurds also have their interests: By freeing territories in northern Iraq from ISIS, they also expand their territory, displacing Arabs from their villages and populating them with Kurdish settlers. According to Isayev, the question of organizing post-war life in Mosul to avoid ethnic and religious cleansing is no less urgent than the struggle against ISIS. At a time when many religious and tribal militias are not under government control, it is not easy to achieve. Another problem associated with Mosul is that a large number of civilians remain in the city. Since the start of the coalition's operation, there have already been reports of civilian deaths as a result of air strikes by the coalition. Yevseyev noted that it is almost impossible to avoid civilian casualties while bombing cities, and Washington understands this, and is trying to avoid a situation similar to that of Aleppo, where the West accuses Russia and Syria of air strikes on civilians. "The Americans now say they would not want to Mosul to turn into another Aleppo for them, so they will strike from the air as little as possible," said Isayev. At the same time, he said, the United States faces a difficult choice: Bombing leads to civilian casualties, but without aerial bombardment, big losses will be borne by those taking the city on land – Washington's Iraqi allies. This complicates both the taking of Mosul and coordination between ground forces of the army, militias and the Kurds. – Iraq's population is, according to various estimates, 37 to 38 million people. The majority (75-80 percent) are Arabs; the largest ethnic minority are the Kurds (15-20 percent), concentrated in the north of Iraq, in the region of Iraqi Kurdistan, which has been effectively independent of Baghdad since the beginning of the civil war. – The Shiites constitute a religious majority in Iraq (60-70 percent of the population), while the Sunnis are a large minority (35-40 percent). ISIS professes a Sunni version of Islam, seeing the Shiites as heretics. The north of Iraq, including Mosul, is inhabited mostly by the Sunnis.